I’ve been meaning to acquire a copy of Ticket to Ride for years now. 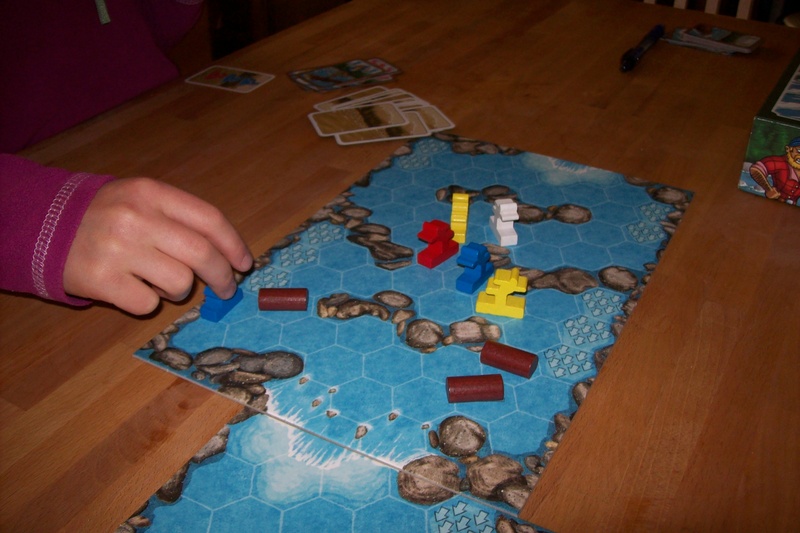 It has developed a reputation as one of the all-purpose games for introducing friends to “proper” boardgames, while also being fun for more experienced gamers. And, increasingly, it is showing up in more mainstream shops (I saw copies in Waterstones this week) as well as the hobby game shops. If you can’t make it out through the awful, blurry photography, this is Miss B completing an awesome trans-continental route, from sea to shining sea. 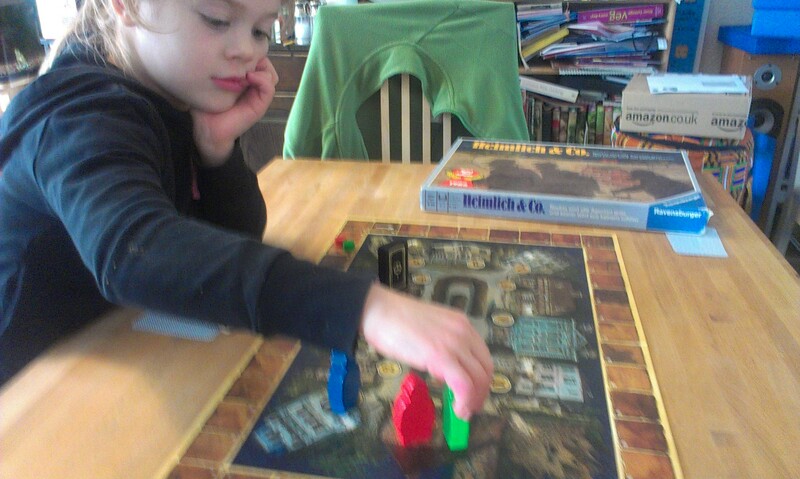 Anyway, having bought a copy as a post-Christmas treat, Miss B and I settled down to play. The rules don’t take very long to explain, even to a six-year-old who wants to take photographs of everything with her new camera, and after a few turns the only help I needed to give was occasionally reminding her where a particular city is. 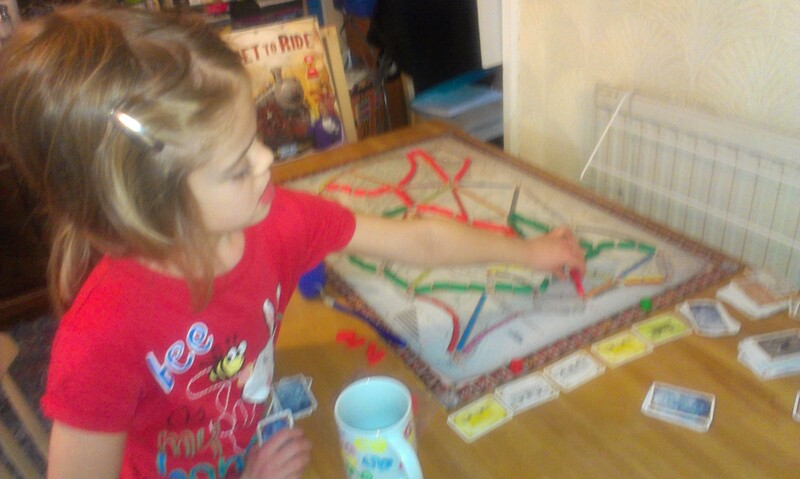 It must be said that I reckon Ticket to Ride is a really good game. New players can get going very quickly, it is easy to see what you need to do in the game, there is a fair bit of randomness, but planning, thinking ahead and trying to work out what other players are up to all pay off and increase your chances of winning. I feel rather sorry that it has taken me so long to get around to playing it. 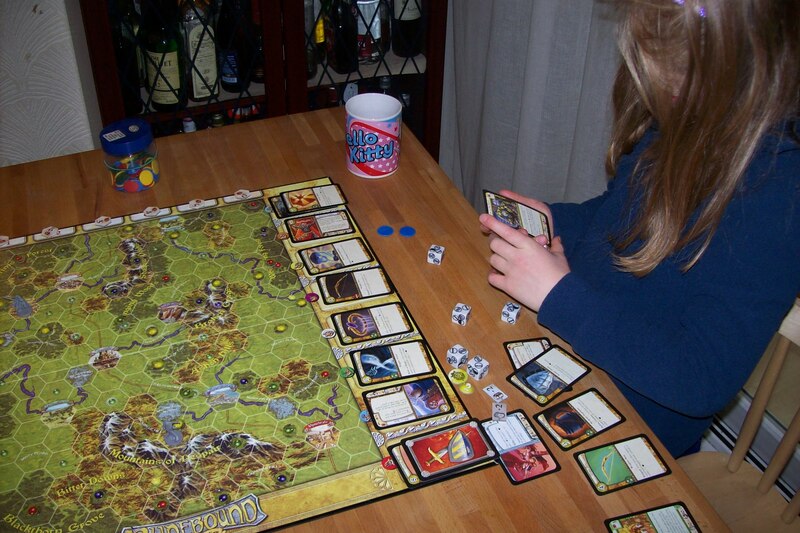 If you want to see what the game is like in play, there was a great Tabletop episode that should give you an idea. As usual I used my “play like a muggle” strategy, which basically involves not trying to directly stuff Miss B any more than necessary. In other words, I tried to make a good route, connect the destinations on my ticket and generally get the best score I could, rather than trying to reduce hers. As a result of this, I got utterly hosed. Miss B quickly connected all her ticketed destinations, then even chose to draw extra tickets and thus ended up getting bonuses for a couple more routes. I managed to get the longest route but it was not enough to catch up with our little rail baron. High-fives all round. That was a lot of fun, and I’m looking forward to some more plays in future, hopefully roping S in to play too. 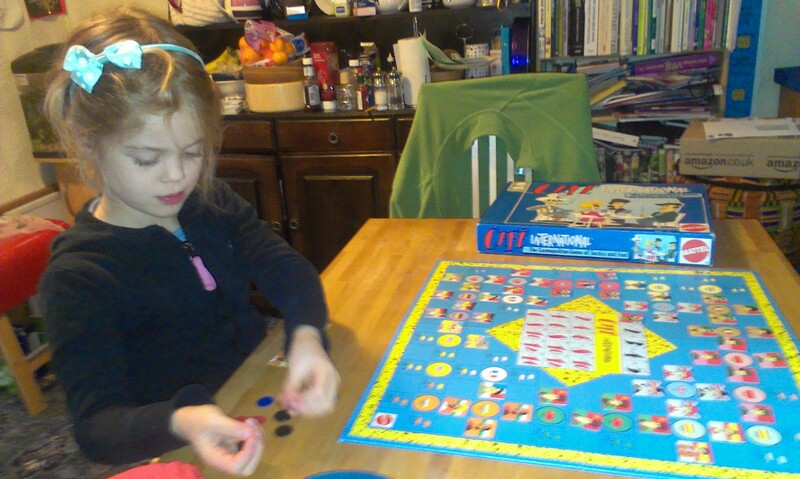 Meanwhile, Miss B has been going on about wanting to have a British version of the game so it can be “Ticket to Ryde”. To be fair, though, I compulsively make the same joke when we visit the Isle of Wight, so we can’t really blame her. 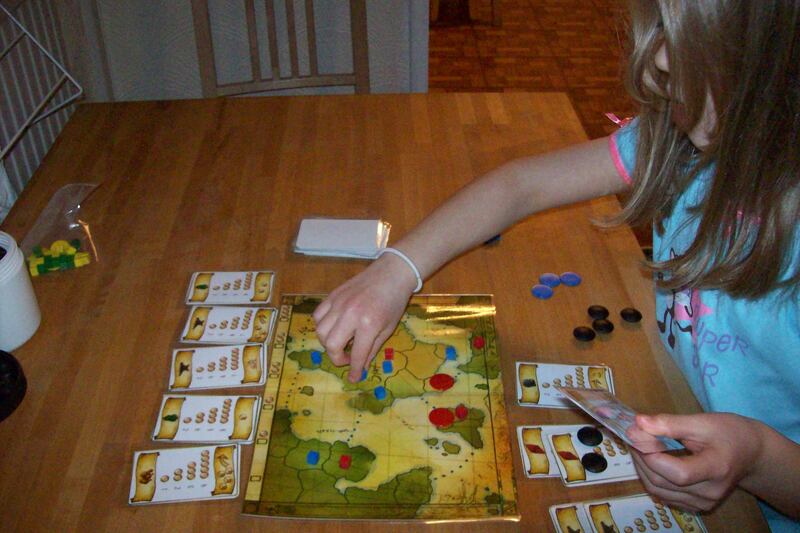 The game: Ticket to Ride (Days of Wonder), 2 to 5 players aged 8+.